To ease the growing pressure on the pathological labs operating in RIMS Premises, the Governing Body roped in MEDALL Healthcare Pvt. Limited in a PPP (Public - Private partnership) mode in August 2015 for a period of 10 Years. Located on the Ground & company conducts around 2000 tests per day and is capable of conducting 1500 different types of tests. The reports are uploaded online or can be collected manually from the collection window. The state govt. bears the expenses of the BPL patients whereas for the rest, charges don't exceed the CGHS rates decided by the Central govt. It is a centre where a person is counseled and tested for HIV, on his/her own free will or as advised by a medical practitioner. The centre is run by the Microbiology department of the college. The main aim of ICTC is to spread AIDS awareness. 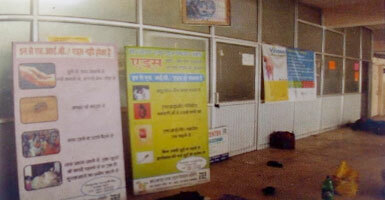 The centre takes recourse to information, education and communication methods through counselling and media campaigns. The centre conducts diagnostic test for HIV, provides basic information on modes of HIV transmission and the preventive measures that can be undergo lifestyle change to reduce susceptibility to AIDS. 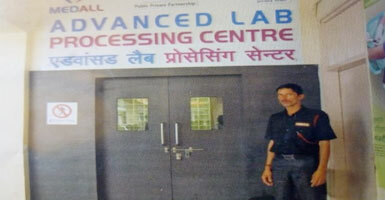 The centre has a well functioning lab, a separate room for counseling and trained counselors. There are two aspects of counseling at the centre. In pretest counseling the patient's for the test is taken. The patient is given information regarding AIDS and its implications. The counseling takes place in a very supportive and confidential environment. The post test counselinghas again two facets. If the patient test negative, he/she is advised to come again after three months. This period of time interval between HIV infection and the production of antibodies. During this time, an antibody test may give a false negative result which means test will be negative, even though a person is infected with HIV. If the patient tests positive, then he is directed to the ART unit fo the hospital for treatment. The patient is provided psychosocial support and is motivated to live a healthy and joyful life. Administration Nodal Officer- Dr. L.B. Pandey Counselor- Ms. Kiran Singh Lab Technician- Mr. Siya Ram Prasad. The ART(Anti Retroviral Therapy) Centre located on the second florr of OPD complex, adjacent to Neurosurgery OPD, provides medicines to those found HIV positive. While BPL patients get medicines free, others have to pay for it. An HIV patient has to take medicines to the tune of Rs 3000 to Rs 4000 a month. Before being referred to an ART centre, a person who display symptoms of HIV is entitled to a free check up at any one of the 64 integrated counselling and testing centre(ICTC) across the state. Once HIV is confirmed, the next stop is an ART centre for medication. IT Associate : COMPUTER Ed.